Disgraced TV presenter Stuart Hall and the BBC are facing at least 17 civil claims from women he is alleged to have abused - more than the number he was convicted for in June. The former North West Tonight presenter and Radio 5 live commentator was sentenced to 15 months in jail for sexually abusing 13 under-age girls between 1967 and 1985. A number of Hall's victims were thought to be seeking damages, and now Manchester law firm Pannone, which is acting for all the women, has confirmed that at least some of the cases relate to incidents for which Hall did not admit guilt. Alan Collins, a partner at Pannone, said: “We are instructed by 17 people who allege that they were abused by Hall. "Some of those were part of the criminal proceedings." 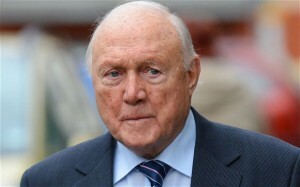 The BBC is being sued alongside Hall in six of the claims, while 11 are acting only against the 83-year-old Hall. Last week, Lancashire Police confirmed it had received further allegations against Hall since he was convicted. The Court of Appeal is also to review the length of the sentence he received following complaints it was "lenient".